Often times it’s easy to get caught up in something. You forget what’s going on around you, and nothing else matters but what is right in front of you. For the past two months, that’s what it was like in Nashville. The Nashville Predators made franchise history, and so many were there to witness it. Each game after the clinching victory against St. Louis became the biggest game in franchise history, and it felt like it every time the Predators hit the ice at Bridgestone Arena. With each passing game, everyone in the hockey world could tell that something special was brewing in Smashville. To those that have been here awhile, we already knew it, but could sense that something bigger was upon us. The party grew larger with each passing round. New fans emerged in Middle Tennessee. Then it grew throughout the state. After that, it seemed the entire Mid-South was following along. Once Nashville reached the Stanley Cup Final, it seemed like much of America and the world was on Nashville’s side. And that’s why it became so special. The magic that is Smashville was finally able to be shared not just with the hockey world, not just the sports world, but the entire world. Many in the media have often spoke about how Nashville is a fun game experience. The 2016 NHL All Star Game really helped elevate the level of hype that Nashville had as a hockey market. 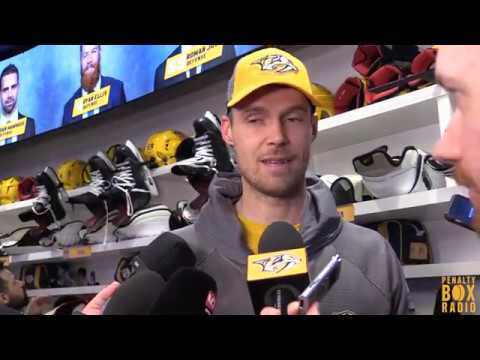 All that being said, it took a deep run, where the Predators were featured night in and night out in the national spotlight, for many to truly realize the type of atmosphere that is in and around Bridgestone Arena. Some may scoff at the chants, the standing ovations and even the Smash Car (where proceeds went to charity, by the way), but that’s what makes Nashville unique. Why were so many media outlets talking about Nashville as it relates to Smashville? It’s not just because it was the first time for the franchise to make the Final, but also because of how the organization and the city handled making it to the Final. As the team progressed through the Western Conference Final, the watch parties began to grow. Fans were filling up Walk of Fame Park…to capacity. Chatter began to build on what would happen if, finally, the Stanley Cup Final and CMA Fest collided. Then, it happened. Arguably the biggest party to ever hit the hockey scene arrived in Nashville. Downtown streets were shut down. Ascend Amphitheater was opened. Bars were full. Theaters were packed. Watch parties were organized all over the state. It became pretty apparent that “Smashville” wasn’t just a nickname for Nashville, but that it was a state of mind. I asked on Twitter last week everyone was watching the game and the responses floored me. Expected responses were at one of the local watch parties, at home or at a bar. There were a few of those, but along with those came replies of Australia, Israel, Scotland, Ireland, multiple Canadian provinces and a ridiculous amount of states. Smashville’s impact is worldwide. It was fairly easy to recognize that sports work just a bit differently here in the south. I’ve never heard of hockey being a “nice sport.” And the fans here make sure the opposing team knows they are going to have to deal with the players on the ice and the crowd in the stands. But that’s part of what makes it unique. The players know it. The coaches know it. And by God, the whole hockey world knows it now. Even with the team down 0-2 in the series for their first home game of the Final, Smashville brought it. The atmosphere downtown was electric. Thousands upon thousands of people filled the streets of downtown Nashville. Pictures came in of watch parties in downtown Knoxville and at the Capitol Theatre in Lebanon. The fever had hit. People of all ages and many different walks of life had now found common ground. Fans wore jerseys to the Nashville Symphony. Old ladies at the salon gossiped about the playoffs. Children flocked to ice rinks. So much of this fever was due to a team making a special run. To this “hack” however, the best thing about all of this is what it’s done for the sport of hockey where I call home. Some still scoff at Nashville now being almost globally accepted as a “hockey town.” To those that do scoff at the term, I question your love of the game. Don’t we all want to see the sport we love be enjoyed by more people? Isn’t it fun to be able to walk into a grocery store and chat up random strangers about the local professional hockey team? Isn’t it an absolute blast to take someone to their first hockey game? First watch party? First playoff game? First Stanley Cup Final game? The growth has been happening for years, but now it’s finally getting the recognition it deserves. So much of that happened in just a few months in Nashville. A lot of that had happened before this run. Many of the season ticket holders now were just children when the Nashville Predators came to town. Some of you have now only been around for a few weeks, months, years. No matter what, you’re a part of something special now. Growing the game takes generations, and this was the spark that launched Nashville into exponential hockey growth. Just think of what this has done for the sport not just in Nashville, but the entire Mid-South. Now’s the time where people are going to be searching for more hockey. Did you know that there’s NCAA hockey just an hour and a half south of Nashville in Huntsville, Alabama? Yeah, that’s right, the University of Alabama in Huntsville has a Division I program. Did you know that Nashville is home to the only junior hockey team in the state, the Nashville Junior Predators of the NA3HL? Did you know that every single SEC school has a club hockey team that you can support, with most being in the South Eastern Collegiate Hockey Conference (and even more local colleges like MTSU and Lipscomb)? Did you know that many of the high schools in Middle Tennessee have hockey teams that would love your support in? And there are so many more. This is your opportunity to continue to support the growth of hockey in the state of Tennessee and the entire south. What makes so much of this special is being able to see an instant boom in people wanting to learn the sport. This is your time to continue what was shown with the tens of thousands of fans outside watching hockey. It’s your turn to continue to the momentum of the sport you’ve recently fallen in love with or is the old flame that you know will never die. The Nashville Predators made you a hockey fan, and now it’s time to make sure that love grows. You’ll never forget the moments during this playoff run. It will carry a deeper meaning to you than you probably think it will. One never really knows if it will be repeated. It could also happen multiple times in the next few years. We won’t know until the journey takes us back there. There is one thing that I do know, and it’s that you proved so many people around the world wrong, along with proving so many of us here, right. But I have a continued mission for you: don’t forget your roots. Don’t forget that we all started out as a new fan to the sport whether we were 5 or 50 years old. Do remember to help spread the love of the game. Sow the seeds of future hockey stars at the local rink. No matter your age, give ice skating a try. Make the trip to Milwaukee and now Norfolk to watch prospects play. Go see the teams where some of your favorite players got their start in North America whether it’s college or junior hockey. Watch more than just the Preds. Fall in love with the game every time you watch it. And you know what? So many of you are already doing this. That, my friends, is how you cement yourself as a hockey town.